“Lyrics from Lockdown” is based on Bryonn Bain’s experiences with the American justice system. The one-man show recently set a record for sold out shows at The Actors’ Gang Theater in Culver City. A new professor in UCLA’s African-American Studies department is rallying with students and faculty around increasingly visible injustices in the U.S. criminal justice system. It’s a topic near and dear to Bryonn Bain’s heart. While attending Harvard Law School, he was wrongfully arrested by the New York Police Department, which he later successfully sued. 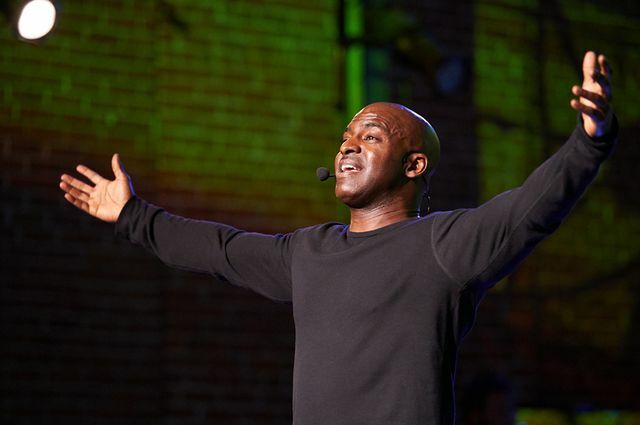 A writer, actor and hip-hop theater maker, Bain has alchemized his experiences into his role as an educator, activist and artist, regularly performing and lecturing on the prison crisis at colleges and correctional facilities nationwide. The recently passed Prop. 47 reclassifies some non-violent crimes as misdemeanors instead of felonies and allows for new sentences, and Senate Bill 260 readdresses life sentences for juveniles who were tried and convicted as adults. At UCLA, Bain has quickly teamed with the burgeoning UCLA Justice Work Group, a coalition of students and faculty focused on education, awareness and advocacy around the prison system, and developing a university center for justice. The group’s mission of interdisciplinary collaboration and movement building is reflected in its ongoing series of arts events, lectures, symposia, free breakfasts and the Human Caging week being planned for a second year this April. Tonight, the JWG, in association with the African-American Studies department, and student-performance group The Word, presents a poetry slam and book drive at the James Bridges Theater in Melnitz Hall from 6 to 8 p.m., benefitting the California Institute for Women correctional facility in Corona. Admission and food (catered by Homegirl Cafe) are free with a book donation, which will go to the prison library. Five poet finalists will compete for cash prizes, and will be judged by women formerly incarcerated at the prison. The winners will perform at the prison in a spoken word concert this spring. Don Liebig/ASUCLA Bain will teach a course this spring at the California Institute for Women. 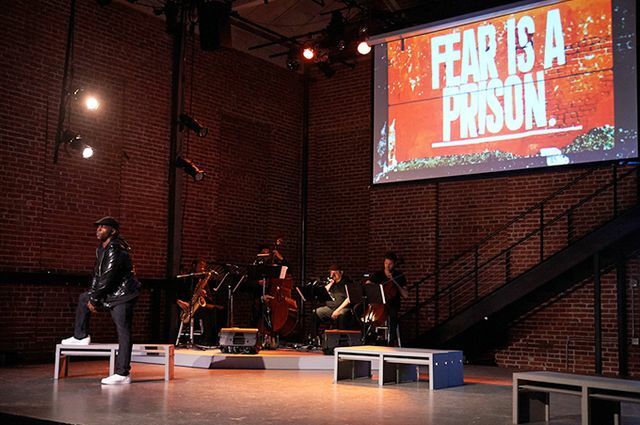 Members of the Justice Work Group encountered Bain and his work last May when he brought his one-man theater production “Lyrics from Lockdown,” based on his wrongful imprisonment, to Schoenberg Hall for its Los Angeles debut. He followed that with a standing-room-only lecture at the Fielding School of Public Health. A job was waiting for Bain in the School of the Arts at his alma mater, Columbia University, but he said a key factor in coming to UCLA was the “new energy” coming from the African-American Studies department and the work of such campus scholars as Cheryl Harris, Robin Kelley, Gay Theresa Johnson, Kelly Lytle Hernandez, Sarah Haley, Scot Brown and others. Bain began teaching last fall in African-American Studies, with a course on “Hip Hop and Spoken Word.” This winter he is teaching “The Revolutionary Politics and Poetry of Malcolm X.” In the spring, Bain will teach a course titled “Narratives of Change,” a critical thinking, writing and performance course that will meet on site at the CIW women’s prison 75 minutes from campus. Bain said he sees an enormous opportunity for UCLA to influence the national and global dialogue as the largest UC. “UCLA is the university with the greatest number of students applying in the world — in the city putting more people in prison than any in the world. How does this university participate in the Justice movement we are building?” he said. Dupuy is part of that conversation. She is currently in the community health sciences doctoral program at UCLA with a minor in law, having returned to school after working in the public health field in Chicago. She is focusing on the intersections of incarceration, justice and health. She’s working with leaders in the juvenile corrections system in Los Angeles to begin instituting health-education programs in those facilities. Dupuy said she hopes the campus group can continue to harness momentum around some of the increasingly publicized issues of criminal injustice and that eventually it will evolve into an official interdisciplinary center for justice at UCLA, modeled after the organization at Columbia University. 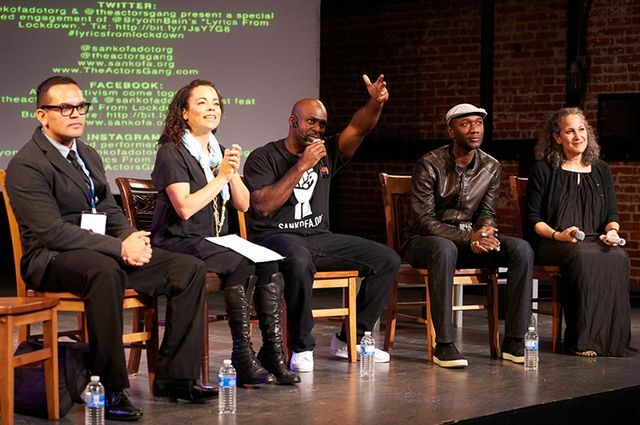 Local leaders and activists, like Michael Griggs, Sabra Williams, who is director of the Actors’ Gang Prison Project, singer Aloe Blacc and director Gina Belafonte, joined Bain (center), for post-show, town hall-style talkbacks about the role of the arts and activism in the justice movement. Those issues take the spotlight once again as Bain brings “Lyrics from Lockdown” back to UCLA for one night only March 4 in Freud Playhouse. Former UCLA professor Angela Davis will open the event, joining by video conference from the annual “Beyond the Bars” conference in NYC. Mumia Abu-Jamal, one of the world’s most influential political prisoners and a former Black Panther, will call in from prison and update the audience on his case. Bain said he went to law school in part to understand power — to decipher who has it, how to obtain it, and what to do with it once we have it. “I know now that race, class, gender and sexuality all play a far greater role than most of my legal casebooks admit,” he said, citing the influence of mentors including Harvard legal scholar Lani Guinier, his show’s executive producer, the legendary civil rights activist/artist Harry Belafonte, to Columbia’s Kathy Boudin and former Black Panther Jamal Joseph — both of whom were incarcerated for more than a decade before becoming Ivy league professors.